I made these paper ornaments the last couple of days. I bought the 3" and 2.5" Marvy Uchida scalloped circle punches from Joann.com. I got some Christmas scrapbooking papers from Michaels. 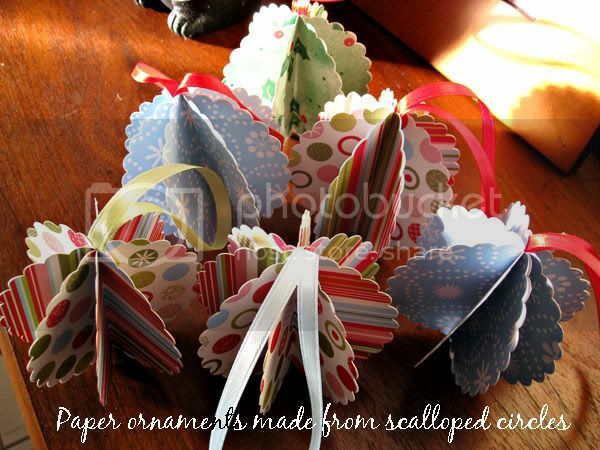 Then I punched out 8 pieces of scalloped circle each to make an ornament. Just fold in half and glue the halves together, and attach a ribbon to the middle before gluing the last piece shut. Easy piecey!